Welcome to the Bird Migration Radar (BIRDAR) FAQ, where I will attempt to answer your frequently asked questions about interpreting the radar. Here we go! 1) how do we distinguish between birds and non-bird data such as cloud cover, pollen, and/or insects? Here are several keys to determining non-bird signals from bird signals. First, if you’re looking at the animated loop, birds are going to enter the radar after sunset, starting nearest the radar station, and growing outward from the center (growing concentric circles). This is because the radar beam is pointing up at an angle toward the sky such that it is closest to the ground at its origin, and highest above the ground at the limit of the beam (farthest away from the origin). Think of an ice-cream cone standing on end, where the bottom of the cone is touching the radar dish, and cone itself extends up into the sky. So, as birds lift off the ground and into the atmosphere after sunset, they are first detected nearest the radar, and subsequently detected further and further away from the radar, as they reach higher and higher altitude. At some point (usually on average around 1500 feet, but depending on the conditions in the atmosphere it may be higher by several thousand feet) they stop rising, and simply continue to move in the direction of migration. Visually, this can be less dramatic when watching radar over contiguous land, such as NJ or PA, but it can be spectacular when birds have to cross large bodies of water, such as from Florida to Cuba. This is because birds have to originate from the landmasses, so you actually get to see them move across the oceanic portion of the radar’s view as they leave the coast and again as they enter the atmosphere over Cuba. Sometime between midnight and 2am, birds begin their descent back to earth, and by sunrise most birds have already landed, that is, if they were migrating over land. On the radar, this is simply depicted as the reverse of what you’d see just after sunset, such that the large mass of migrating birds decreases first from the farthest point away from the radar station (the highest altitude) and eventually to the center of the radar beam closest to the station (the lowest altitude). It should be noted that no other organism will cause this signal so intense as birds… but there are a few that can cause a similar signal, and therefore can inflate the magnitude of bird migration interpreted by the viewer. Insects are the main offender in this regard. Using the velocity image, though, you can get an idea of how much non-bird noise you’re seeing on the reflectivity image. Birds tend to migrate 15-20kts faster than the prevailing wind (given the wind is a tailwind), so by checking the winds at 950mb (2500 feet, roughly), you can determine the wind speed, compare it to the speed at which the objects are moving across the radar, and therefore rule out any object traveling too slow to be birds. In the case that winds are 5kts out of the north, anything traveling around 5kts can be disregarded as non-bird data… it could be dust, pollen, or insects, but regardless, it’s not likely to be birds. Now if the wind is a cross-wind, instead of a tail-wind, simply noting the direction that objects are moving across the radar relative to the wind direction will enable you to determine whether birds are migrating or not. If the wind is 10kts out of the west, but the radar indicates objects moving due south at 10-15kts, you can rest assured that these are birds, since I know of no migrating insect which can fight a 10kt wind well enough to change the course of travel. Obviously dust and pollen are going to travel at wind speed and in the prevailing direction so they are quickly ruled out. 2) are there colors that specifically relate to birds? Bird signals tend to fall within the 5 – 25 decibel (dbZ) range. 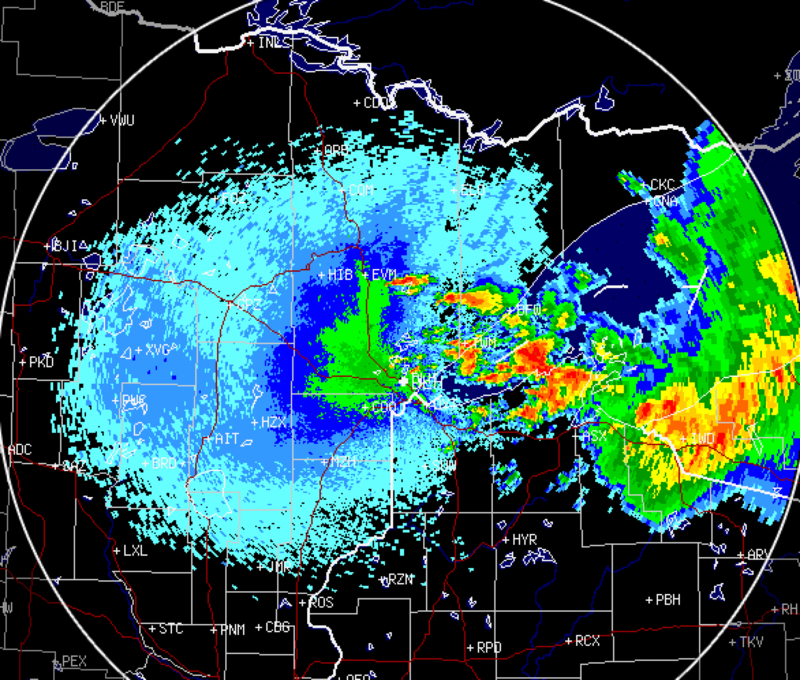 On most radars that corresponds to the light blue->dark blue->light green values on the Base Reflectivity image. 3) is the entire mass of color peeling off the Florida peninsula solid birds???!!! Yup. Or more likely, “mostly”. There are likely some insects involved, but yes, for the most part these are birds. Isn’t it friggin’ cool?! 4) if Iâ€™m interpreting these right, which is unlikely, why would birds be leaving the Florida peninsula in a southeasterly direction? They can be heading for the Yucatan (some of the birds launching off of northwest and western Florida) Cuba, the Bahamas, Puerto Rico, and all islands in-between. It depends on the wind conditions, time of year, etc. 5) (from Wade, in Iowa) Iâ€™ve just discovered tracking bird migrations using radar, but the problem that I have right now is viewing the overnight images.Â How do you do it?Â Do you go back in the NOAA archives or how?Â Iâ€™ve tried to figure it out, but I know when Iâ€™m stuck, and Iâ€™m stuck!Â The reason I ask is because I live in Iowa and the information you have is great, but it doesnâ€™t pertain to me. Thanks for the email, Wade. I’ve put together a little video tutorial I hope you (and others) will find helpful. Video tutorial for viewing nocturnal bird migration using radar from David La Puma on Vimeo. 6) (from Jason in DC) How far do nocturnal migrants typically fly each night?Â I know it’s different for each species and family, but it would be interesting to have an idea if we see migrant activity up in up-state NY and estimate if those birds will be in DC the next morning or the following, or whatever. So the distance that a bird flies in a night is a function of its ground speed (its speed relative to the ground- which is its airspeed modified by any wind effect) and its flight time. On average, songbirds fly 10-30mph in the absence of wind assistance (or hindrance). When looking at terrestrial migration the radar, we often see migration activity beginningÂ just after sunset, peaking around midnight, and decreasing steadily into the early morning hours. Birds therefore are landing throughout the early morning hours with the majority of them having landed by civil daylight. That would mean birds were migrating between 5 and 10 hours during a single event. Okay, so based on those numbers we could expect birds to migrate between 50 and 300 miles depending on both their average flight speed and the amount of time in the air. If we take the average flight speed of 20mph and the average flight duration of 7.5 hours, we could expect most of the migrants departing a given area to fly 150 miles. If you know the wind speed and direction you can add or subtract the effect of the wind to get a better idea of flight distance. For instance, if birds have a 10mph tailwind and fly 20mph on average unassisted, then you can expect them to be flying at 30mph ground-speed. Side-winds, of course, will have a varying effect on ground speed since the effect of a head or tailwind will be tempered by the birds compensation for drift.Â A recent study by HÃ¥kan Karlsson demonstrated that migrating passerines in Sweden showed very little divergence in wind and ground speed, suggesting that birds migrated under light wind conditions. If true for North American passerines, then using the average non-assisted flight speed to estimate flight distance may be ‘good enough’. So, to your second question, in the absence of assistant winds, if you assume that most birds will migrate ~150 miles during a night you can expect that the bulk of birds from around Harrisburg, PA to be making it into metropolitan DC by morning. Just input the radius (150 miles, or whatever you choose) and your location, and generate a map showing the source of your migrants. This is the (current) end of the FAQ, but I highly recommend you take so time to peruse the website for the Clemson Radar Ornithology Lab, here: http://virtual.clemson.edu/groups/birdrad/comment.htm If you have any specific questions, please send them via email to me at david@woodcreeper.com and I will attempt to answer them here in the coming weeks.